Grandview Prestige Screens Canada -Fabric available in matte white, grey or silver -The Fixed-Frame Cinema screen is enclosed in an attractive black velvet wrapped lightweight alloy frame -Suitable for HD television/movies -Installation is suitable for home theatres, scientific research institutions, government, command centres, and etc. -Two buckles are installed in the frame making it easy to hang it on the wall. Easy installation is also available for an in-wall display. -Screen uses the PS Series high contrast (while maintaining 1.0 gain) fabric that provides high quality images superior to traditional white matte materials. -The PS Series flexible screen uses a special fabric containing miniature and fine veins that work effectively to remove purple light and light waves while fully reverting colour. 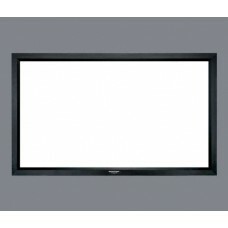 -The Fixed-Frame tension design system ensures that the screen is as flat and level as the mirror.